A nourishing breakfast bowl of warm Maskal Teff® grain infused with chai spices. 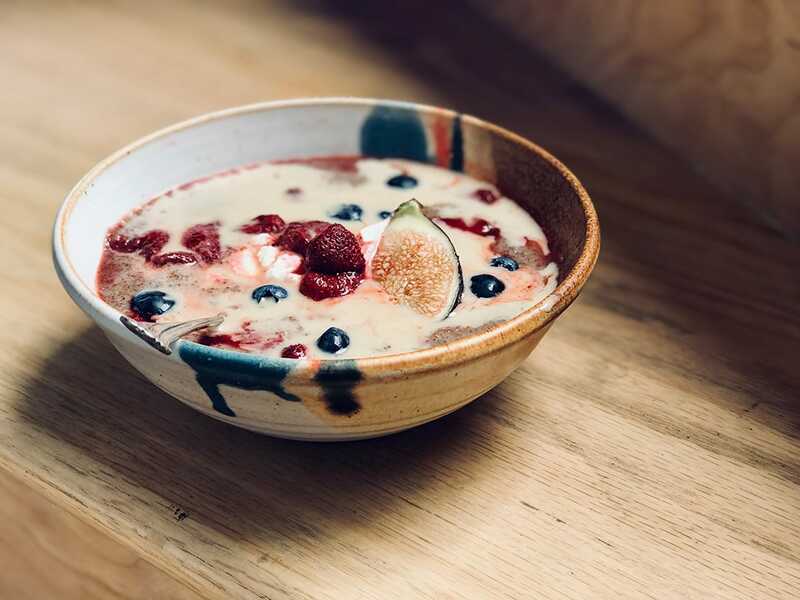 Top this delicious oatmeal alternative with warm fruits, coconut yogurt and a splash of macadamia milk infused with chai. Place the loose leaf tea and the macadamia milk in a saucepan and heat gently on a low heat. Simmer for 5 minutes and then strain the warmed steeped milk into another vessel. Add the teff grain, coconut oil and water to the saucepan and heat over a medium heat, stirring regularly. Once simmering turn the heat down to low. Cook for around 10 minutes, and then add one cup of the steeped chai milk. Cook for a further 10 minutes. While the porridge is cooking, warm the berries in a small pan with vanilla and maple syrup, stirring for 5 minutes. Set aside. Pour the cooked porridge into 2 bowls, top with warmed berries, a dollop of yogurt & a splash of warm macadamia milk.